Daylilies… Easy to Grow, Fun to Collect! Few perennials can match the daylily (Hemerocallis) for versatility and durability. 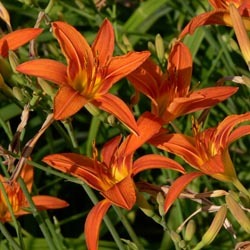 One of the most popular perennials, daylilies have become a collector plant for novice and experienced gardeners alike. Thousands of named cultivars are trouble-free to grow and adaptable to many conditions, which makes daylily collecting fun and easy. Although each lily-like flower lasts only one day, there are always more buds to open which provide summer color and a subtly changing garden for many weeks. Just as there are many different daylilies to try, there are many different ways to try them. Plant them individually for a pop of color, or create a mixed border with other plants or multiple daylily types. Daylilies can be a fun surprise when naturalized in a grassy area or grouped in a mass as a groundcover over larger areas. Taller varieties can even become simple screens or create gentle privacy surrounds. 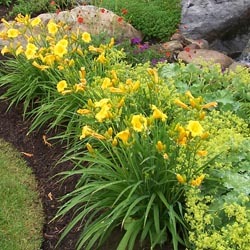 The creative gardener may even use multiple daylilies to create fun patterns or pictures in a themed flowerbed. Daylilies tolerate dry, poor soil, but perform best and reach their full potential in rich well-drained beds. Different cultivars have different needs for sunlight, moisture and fertilizing, and while these flowers do well even if somewhat neglected, it is best to try to meet their needs so each bloom can flourish. Some will tolerate drought and frost better than others, while certain cultivars need more attention. All are quite low-maintenance, however, and will thrive for years even in marginal conditions. Hyperion – 40” tall, space 18-24” apart. Delightfully fragrant, large, 5” primrose-yellow flowers with a green throat in mid to late summer. Full sun or part shade. Mary Todd – 26” tall, space 24-30” apart. Golden or buff 6-7” flowers on a semi-evergreen foliage. Blooms midseason. Full sun. Stella De’Oro – 12-18” tall, space 18-24” apart. Golden yellow 2-3” flowers with a green throat on a compact plant. Reblooms all summer. Full sun. Joan Senior – 25” tall, space 24-30” apart. Near-white 6” flowers with a green throat on an evergreen plant. Blooms midseason. Full sun. Becky Lynn – 20” tall, space 24” apart. Large, 6” rose-blend flowers with a green throat in a semi-evergreen plant. Blooms midseason, then reblooms. Full sun. Rocket City – 36” tall, space 18-24” apart. Eye-catching, two-tone orange blossoms are up to 6” across. Blooms midseason. Full sun or part shade. 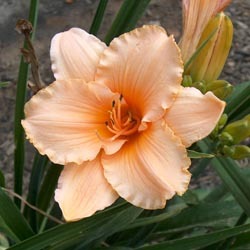 There are always more daylily types to try; come in today to see the latest, hottest, most amazing cultivars of these versatile blooms, and you’ll be eager to add more of them to your landscape. The American Hemerocallis Society has classified daylilies by flower size. A miniature has flowers less than 3” in diameter, small-flowered cultivars have flowers from 3-4.5” and large-flowered cultivars have flowers 4.5” or larger.